The production of clean data is a complex and time-consuming process that requires both technical know-how and statistical expertise. Statistical Data Cleaning brings together a wide range of techniques for cleaning textual, numeric or categorical data. This book examines technical data cleaning methods relating to data representation and data structure. A prominent role is given to statistical data validation, data cleaning based on predefined restrictions, and data cleaning strategy. Focuses on the automation of data cleaning methods, including both theory and applications written in R.
Enables the reader to design data cleaning processes for either one-off analytical purposes or for setting up production systems that clean data on a regular basis. Explores statistical techniques for solving issues such as incompleteness, contradictions and outliers, integration of data cleaning components and quality monitoring. Supported by an accompanying website featuring data and R code. 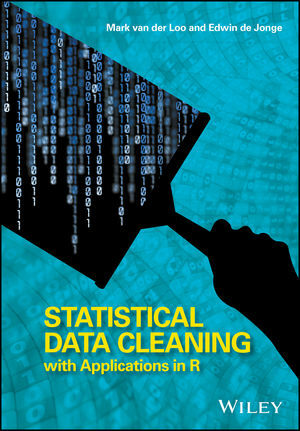 This book enables data scientists and statistical analysts working with data to deepen their understanding of data cleaning as well as to upgrade their practical data cleaning skills. It can also be used as material for a course in data cleaning and analyses.